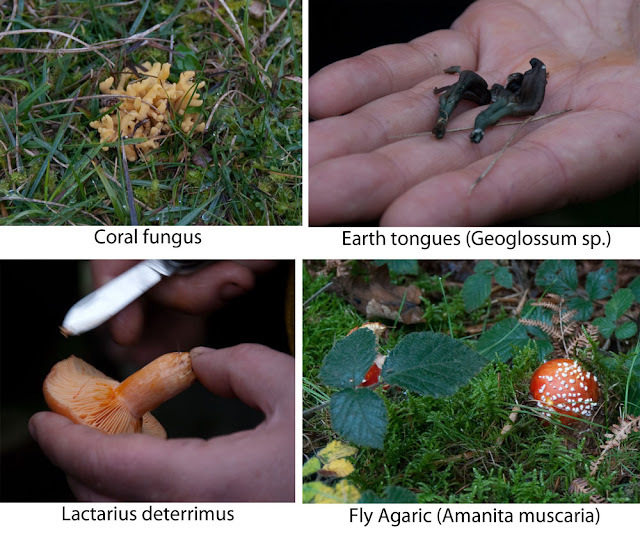 ﻿﻿﻿﻿﻿﻿﻿I had a fabulous day out at Dolebury Warren on monday identifying late autumn fungi with expert help from local ecologist and mycologist, Justin Smith. What a day we had! There were carpets of fungi to be found of every colour imaginable! If you're out and about in Dolebury this autumn then have a look through the pictures below to see what you could find. 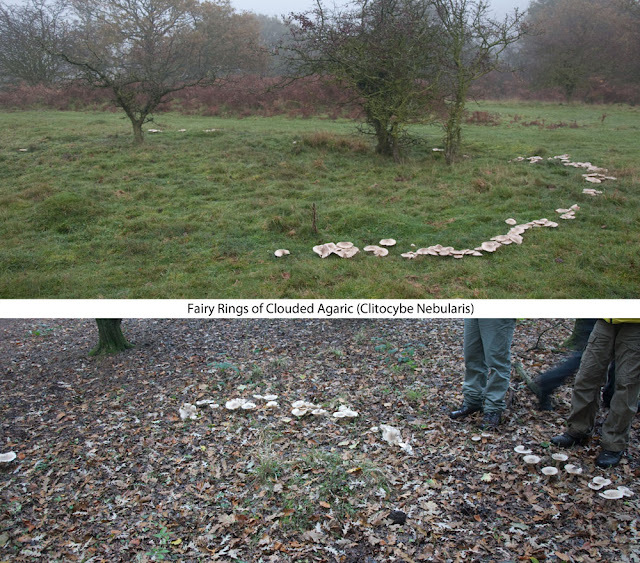 We found some very impressive fairy rings of Clouded Agaric﻿. The size of fairy rings can be used to determine how old they are since they move outwards with time. I enjoyed some of the Wood Blewit for my dinner, fried in garlic and butter...mmmm. 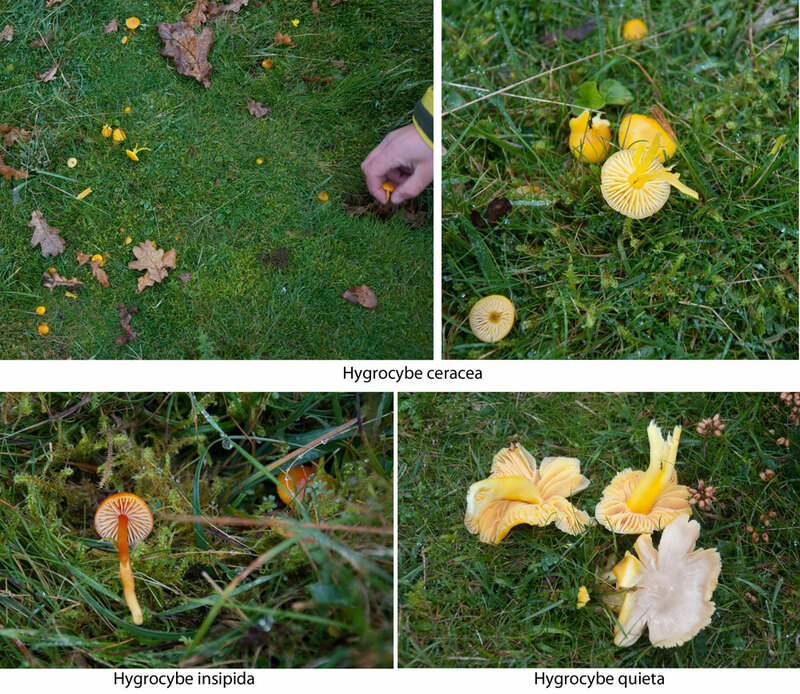 There was a huge array of different wax cap species that we found in the grass land areas of the reserve. These are often brightly coloured species with slimy caps. The slimey surface of many fungi acts as a protective measure against slugs and snails which although slimey themselves, are not so fond of other slimey things! 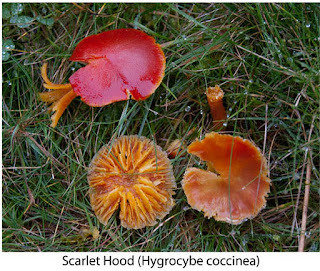 The bright colours of many of the wax cap fungi may make them appear poisonous however, a number of them, including the Scarlet Hood are in fact edible. 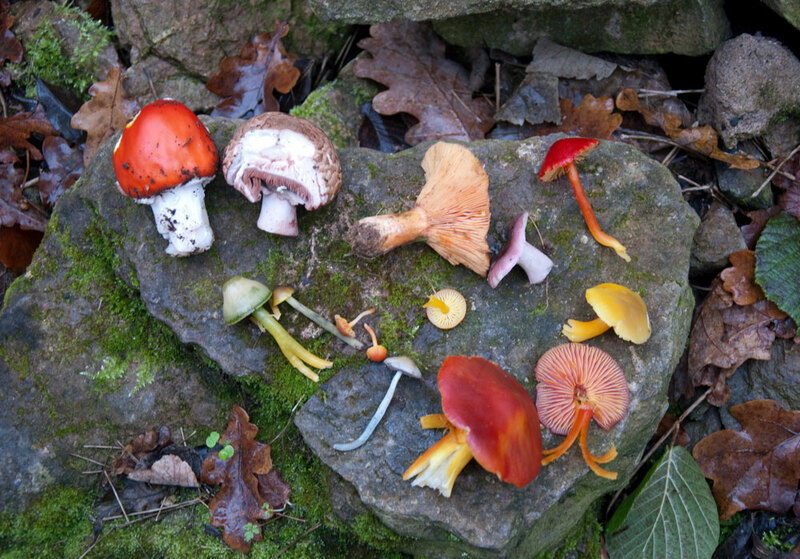 The distinctive smell of some fungi help in their identification. 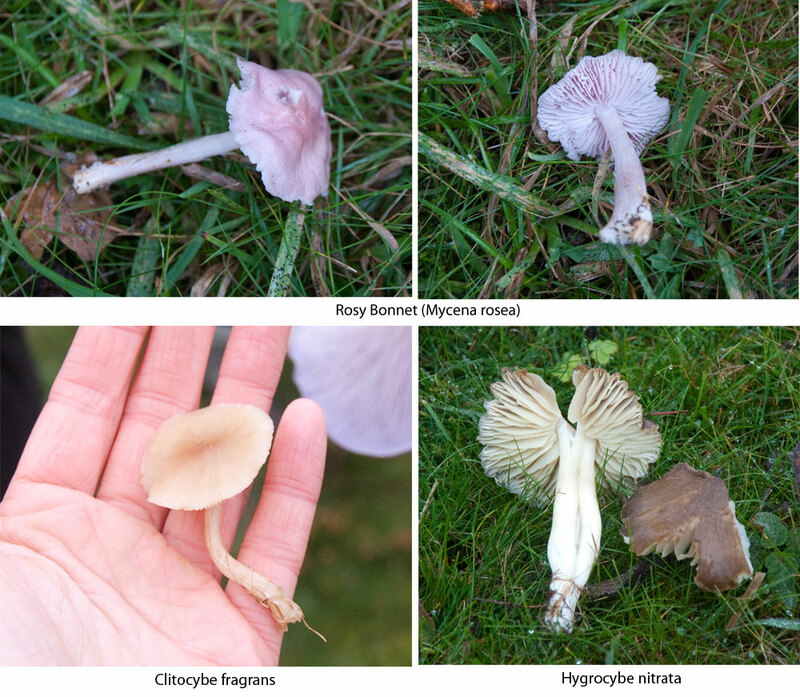 Rosy Bonnet (Mycena rosea) smells of radish; Clitocybe fragrans smells of aniseed and Hygrocybe nitrata smells of bleach (nitrous...hence the name). The milk cap Lactarius deterrimus exudes droplets of 'milk' when damaged. This specimen gave a bright orange milk which turned dark red within 10 minutes. You need to have a keen eye to spot Earth tongues. If you look carefully, you might see a few of these poking up out of the grass like little elf ears...or tongues! And finally, the infamous Fly Agaric (Amanita muscaria) which we found nestled under some trees. It is probably the easiest fungus to identify with its distinctive red cap with white warts, and is often depicted in fairy tales alongside elves and goblins. This fungus gained its name from the medieval tradition of breaking it into milk and using it to stupefy flies for easy swatting. There are more fungi photos from the day on our flickr page. 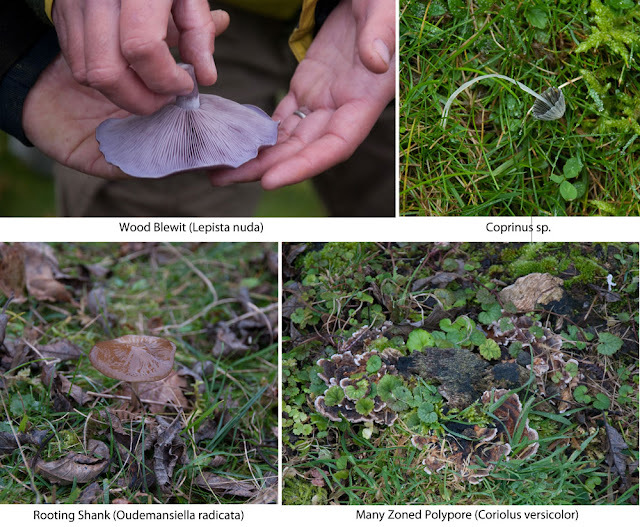 Thanks to Justin Smith for sharing his knowledge on a fantastic fungi filled day at Dolebury Warren!